Several of us have been working on a design for a low-power, open source datalogger for use in environmental monitoring for a while now. This idea was sparked by a suggestion from Mark Green that we might be able to develop a device that would make it far easier and less expensive to collect hydrological data than is possible with the current array of proprietary sensors. After a lot of discussions with a lot of clever people, Ben Gamari and Laura Dietz decided to build off the already-flourshing McHck project, and designed a board that they called the Riffle. The design, based on a solid, well-supported ARM microcontroller -- the Freescale MK20DX128, which has lots of features nicely suited to low-power computing, is nicely documented here: https://github.com/bgamari/riffle, and was initially intended to be used in a PVC enclosure with an elegant, custom 3D printed sensor-array cap (though the form factor of the datalogger itself is so small that it could easily be inserted in any number of off-the-shelf enclosures). Ben and Laura were even able to create a browser-based system for reading data from the device, graphing it, and setting parameters, and had developed solid firmware for capturing analog readings, using I2C devices, and the basics of what one needs for field data logging. This remains an exciting platform to explore in the near future, and I hope to write more about it in research notes soon. I'm going to refer to this design as the 'Riffle-K20'. Meanwhile, in parallel, we also decided to begin exploring a Riffle design that leverages the Arduino Uno platform, using hardware that leverages the firmware libraries developed for the Atmel 328p -- the chip around which the Arduino Uno is based. 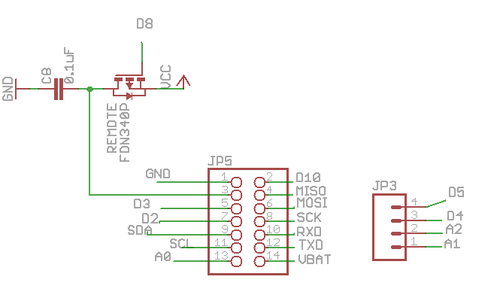 This chip, the 328p, is not nearly as advanced as that used in the Riffle-K20 design; it is not even the most advanced chip supported by the Arduino IDE (the popular way of programming an Arduino). But the 328p has the advantage of being very well supported by a large online community, with libraries that have been 'battle tested' and documented to an enormous extent. As a way of introducing open source hardware into the environmental community, then, relying on well-established and supported libraries seems like a useful, parallel approach. I'm going to call it the "Riffle-328p" (I'd been calling it the "Riffle-ito", before). The most recent shift in the design, however, concerned the consideration of adding radio to the project. 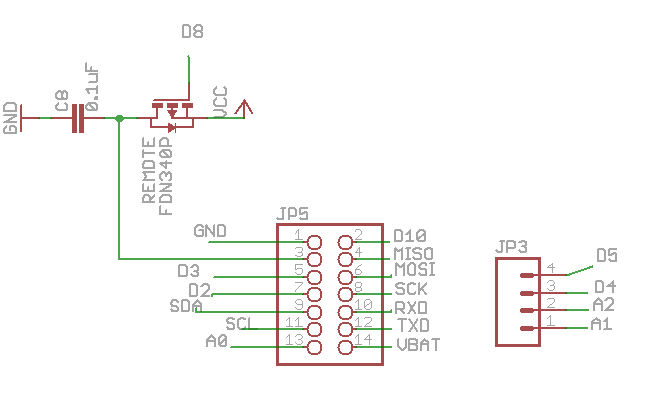 On the advice of George Gallant and Rui Wang, I'd looked into placing an RFM69 radio chip on the board, as is done with in the fabulous 'Moteino' project. After fiddling with various configurations of pins, I ended up deciding that rather than place the radio on the main Riffle board, I would simply break out all of the pins required in order to connect to a radio externally. 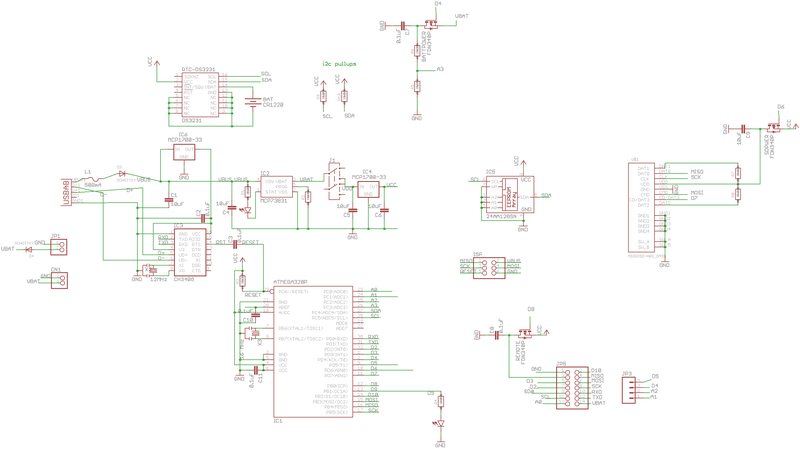 What you're looking at in that above schematic is the 2x7 connector at the end of the Riffle-328p board. The first thing you might notice is this odd spaghetti structure in the top left. This is basically a 'power switch' so that when we're powering add-on sensors, which have their own drain on the battery, we can shut them all off when we're asleep (this was Ben's clever idea, originally implemented in the Riffle-K20). On the left column of pins we have all of the pins necessary for talking to our latest design for the basic contingent of sensors for water monitoring: temperature, conductivity, depth, and light level: D2 and D3 as hardware interrupt pins for measuring frequency counts (we're using a 555 timer to measure conductivity and depth), A0 as a 10 bit ADC for measuring thermistor values (temperature), and SDA and SCL (the 'I2C' bus) for interfacing with one of the many light sensors out there that use the I2C protocol. On the right column, we're including the SPI bus interface (MISO, MOSI, SCK) that the RFM69 radio (as well as many other sensors) speak; as well as RX and TX to expose the serial interface, and the raw voltage coming directly from the battery (rather than the regulated 3.3V that is controlled by the 'power switch' in the other column). This would be useful as a stand-alone, battery-powered monitoring node, which could also broadcast its values back to e.g. a Raspberry Pi that has a Moteino on a USB port. Because we are also exposing the serial interface via two additional screw terminals, we could alternatively use RX and TX to talk to Adafruit's nice new FONA GSM modem, in lieu of the RFM69, to get our data online. So, I'm excited about this version of the design! I'm hoping that providing Eagle CAD files like the above for these 'breakout boards' might allow folks to consider their own constellations of sensors, useful for particular projects. There are still issues to work out in the layout -- I'm still learning the basics of PCB design, and there are plenty of things that I think will be appear obviously sub-optimal for someone who has experience -- but I'm sure we'll get to a good design, collectively, bit by bit! OMG riffle rises again!!!! So happy! Is there a github repository for the board? I'm prototyping a sensor network to monitor urban runoff water quality and report unusual / potentially illicit pollution discharges. Unfortunately, I don't have any fabrication experience and am working on a tight timeline. Is there a way to get a hold of already built Riffles?